E-commerce in Switzerland is in the maturing phase and is growing faster than other countries in Europe such as Germany and Great Britain. 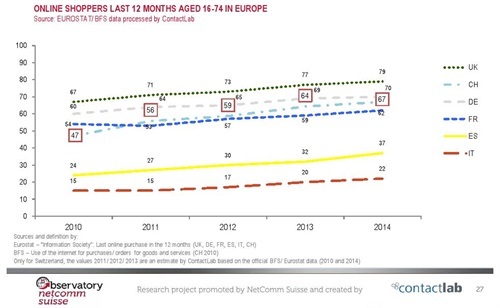 Baden, November 25th 2015 – Swiss consumers have consolidated their digital habits. In 2015 the e-commerce market grew 13% from 2014, reaching a general value of 9.1 billion CHF. 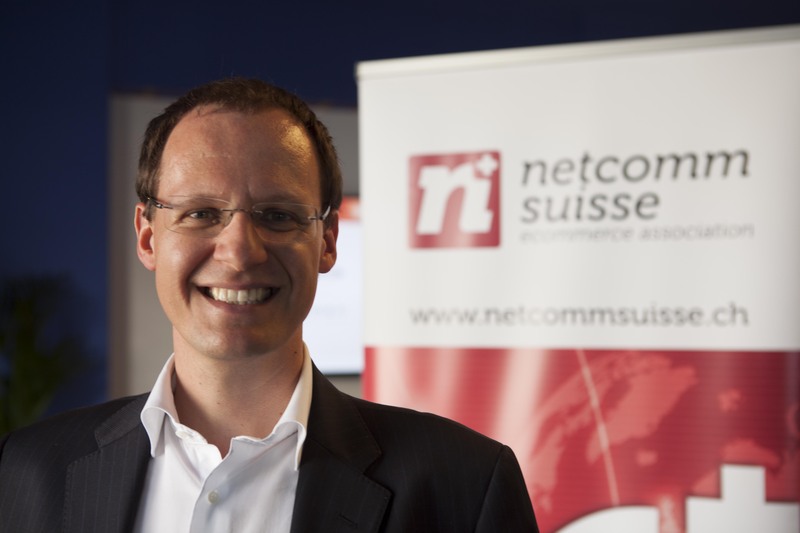 The state-of-the-art of the sector and data about this growth have been released today for the Swiss e-Commerce Conference, organised by the association NetComm Suisse. The objective of the second edition of the conference is to give an overview of the e-commerce market in the country, focusing particularly on the behaviour of Swiss consumers online. 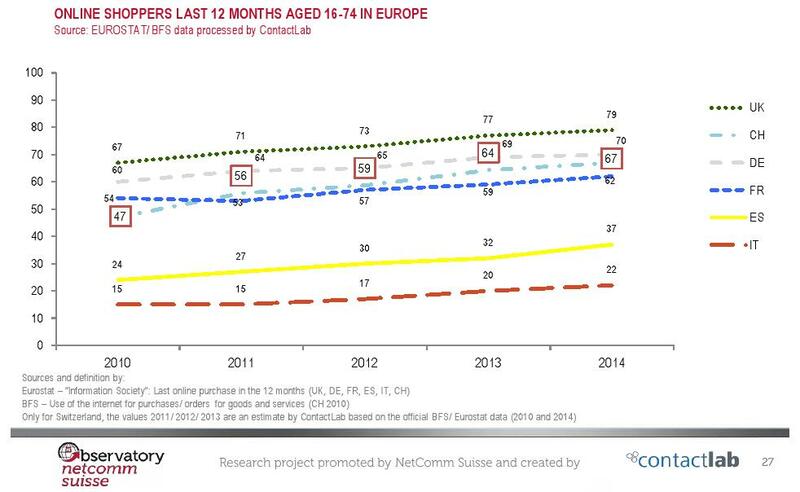 According to the Swiss e-commerce Consumer Behaviour Report, conducted by ContactLab, which is part of Observatory NetComm Suisse, almost all of 16-65 year olds, that is 95% of the population or 5.2 million individuals, are regular users of the internet. Of these 90% purchased at least one product or service in the last 12 months, a level of penetration that places Switzerland among the leading countries in Europe for e-commerce along with Great Britain (93%) and Germany (92%). 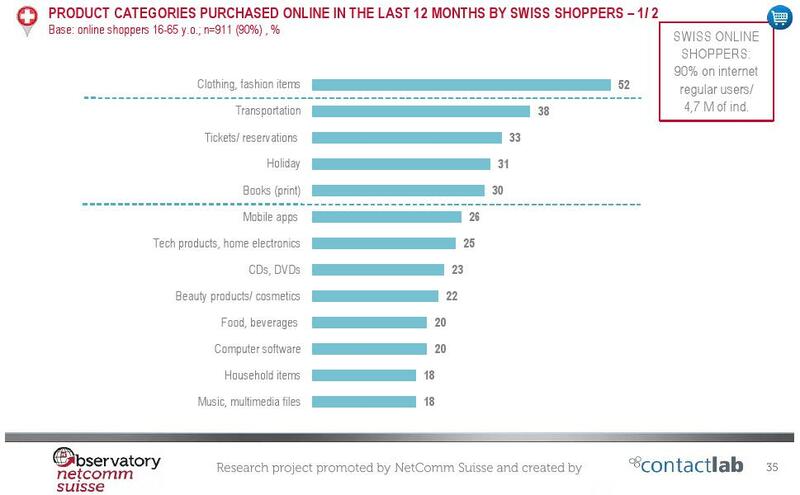 There are 4.7 million Swiss online consumers, up half a million from 2014 (+12%). In Switzerland the general spending index for a number of specific categories, including travel/transportation, technology, food, insurance and children’s products, is significantly higher than that in other European countries. In terms of product categories, fashion products are the top preference for 52% of buyers, equalling 2.7 million individuals. 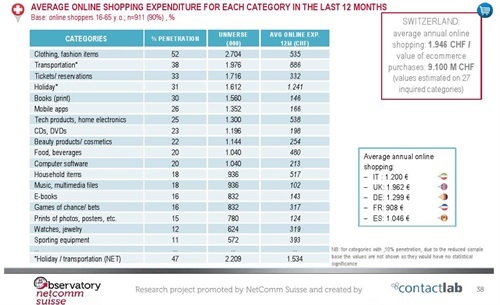 However, services are still generating the majority of the value of e-commerce, primarily transportation and travel, on which the Swiss spend more than 1,500 CHF online every year. “While last year we presented what we called the Swiss Factor, in this edition we want to talk about Made in Switzerland as a strategy for drawing companies’ attention to the potential of carrying out their activities in the e-commerce market as well as the current entry barriers, which have been lowered,” says Carlo Terreni, General Manager of NetComm Suisse and Head of Observatory NetComm Suisse. “In terms of online purchases, consumers have three main favourite payment methods: in first place is Paypal (43%), followed by credit card (40%) and then cash on delivery (39%). 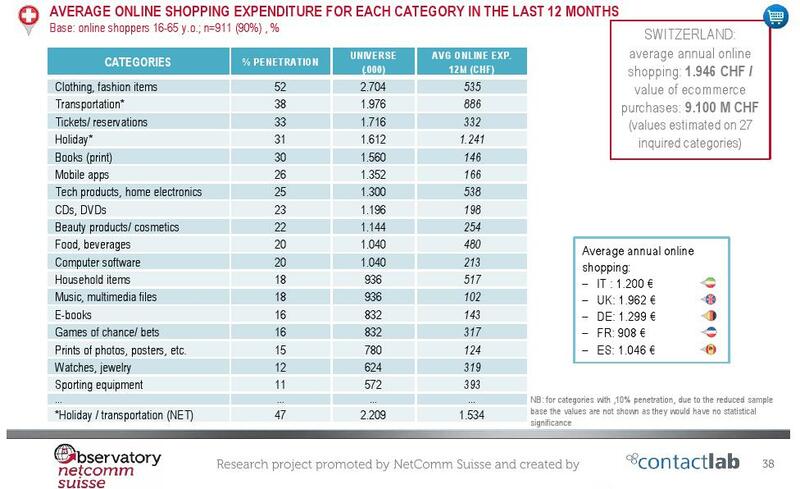 Consumers who prefer paying by credit card spend on average more (+41%) online than other shoppers”. 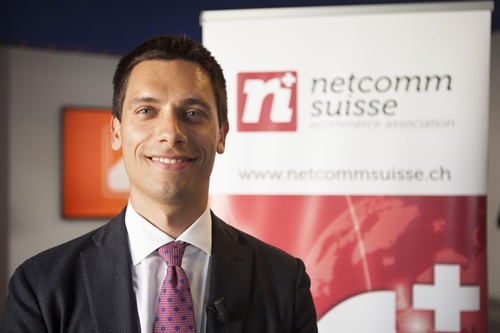 “The second edition of the Swiss e-commerce Consumer Behaviour Report, conducted by ContactLab, identified unexpected two figure growth in 2015 of a market that is already mature in terms of the consumer/e-commerce relationship,” explains Stefano Lena, VP Sales & Marketing for ContactLab. “The country has a number of particularities, like a much higher shopping index, compared to the rest of Europe, for a number of product categories and a preference for e-commerce sites that also have a physical sales point, demonstrating how important it is to break down all the barriers between the digital and physical worlds. The report confirms the exponential growth of the use of the internet from mobiles in Europe, which requires companies to shift their thinking to “mobile first”. Strongly emerging this year is the need for companies to have a solid strategy for digital customer engagement to win the competition battle: from email marketing to social media, companies must concentrate their efforts to develop an integrated strategy that can generate value for the consumer. Swiss online shoppers prefer to buy from websites of retailers that also have a physical store (41%), followed by mono brand e-commerce sites (38%). Retailers with e-commerce channels are more trusted by consumers by an average score of 7.3. Trust is slightly lower for price comparison sites and general e-commerce portals. Flagship brand e-sites are nevertheless the most frequently used channels for finding out information to help consumers decide which product to choose. Among the different sources of information, price comparison sites, online reviews and newsletters also play an important role. An intrinsic element of the analysis into the potential of e-commerce is click&collect, currently only used by a minority of consumers, but which has strong potential: the total prospect of click&collect is 45%, below average compared with other countries where there has been higher interest in reserving/paying online and then picking up your product in store. 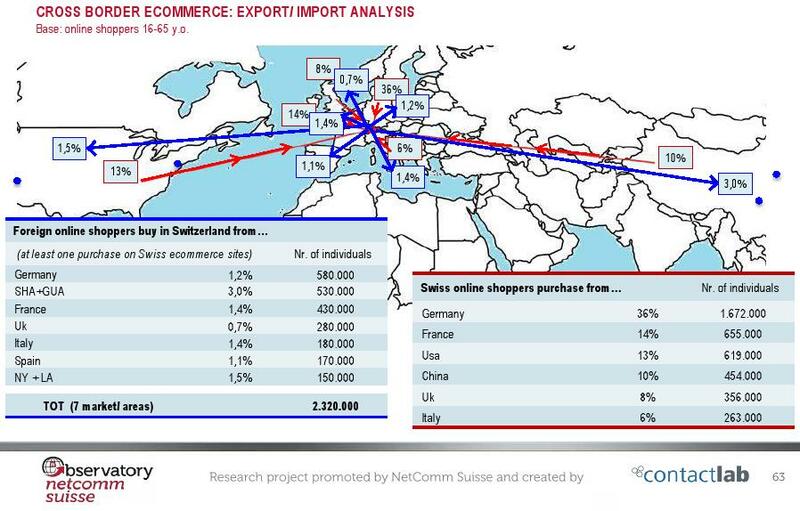 The Swiss mostly look abroad for better prices (for 72% of crossborder purchases), driven by the need to find products that are not offered on domestic sites (41%) or to have more choice or a better range of products (37%). Digital (device = mobile) increases the opportunity for engagement with Swiss consumers in a spontaneous (earned media = social) and guided way (owned media = newsletter). In addition to a further increase in mobile, now involving 71% of internet users (+16/17 % for both smartphones and tablets), there has been an increase of “triple players” (i.e. users connecting with smartphones, tablets and PCs), which is up 31% from the previous 12 months. The level of interactivity of online shoppers remains mostly unchanged, though there has been an overall increase in the number of active users and a reduction in the most basic users. In terms of the relationship with social networks, 87% of online shoppers are active on at least one social platform (83% on Facebook, 49% on YouTube, 44% on Google+, 29% on Twitter, etc.) and a good number use this channel to connect with the brand. Of these users, almost 90% are signed up for at least one newsletter: fashion and tourism are the most popular topics for average sign up rate of 6.5 newsletters per consumer. Newsletters are seen as a very effective tool for communicating with the brand and finding a direction through the various propositions coming from e-commerce sites (79% of users say they have bought online having followed a link contained in a newsletter) and offline (74% went in store to buy a promoted product). Contactlab offers the choice, confidence and comprehensive experience needed to enable customer engagement and drive growth. The choice of extensive customer-centric solutions, multichannel and multi-language; the confidence of enterprise-grade platform with security, reliability, management and scalability; and the comprehensive experience of a team of industry professionals, with market-leading customer service and support. Contactlab enables brands to plan, build and monitor effective integrated campaigns to drive growth. Brands can use Contactlab solutions to build personalized digital contact plans, shaped around product lifecycle and people behaviours, to expand and deepen the retail experience. Our expertise in digital behavior, new customer journey paths and high focused lens on Luxury, Fashion and the Retail sectors, supports brands to build their integrated customer engagement strategy.